A global culinary adventure awaits, at this Capitol Hill spot. Forgive me, Nue, for taking 10 months to discover you. 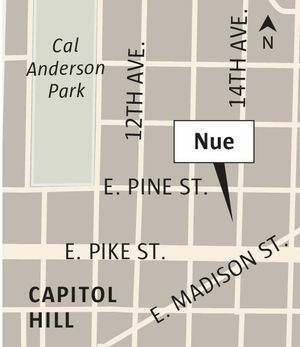 I know you’ve been there since January, right next door to Omega Ouzeri, because I’m in your neighborhood a lot, what with all the new restaurants sprouting along the Pike-Pine corridor of Capitol Hill. I had often peeked into your inviting storefront, chockablock with souvenirs that your “chef patron” Chris Cvetkovich has collected over decades of road trips around the globe. Sitting inside at one of your three, long communal tables, one can better appreciate their whimsical display — beer coasters, pachinko machines and animal skulls alongside travel guides, cookbooks and bottles of wine — arranged on shelves that look like colorfully stenciled plywood packing crates stacked from concrete floor to ductwork ceiling. It’s like magically entering a volume of Culinaria. Cvetkovich is a tech entrepreneur, but also a hands-on restaurateur. He develops the recipes along with executive chef Joe Swain, who’s in charge of the cooking and the kitchen. After studying your menu online, I invited my most fearless dining companion to join me, someone who was as eager as I to try whole grilled octopus confit cooked in lardo from Mangalitsa pigs, Barbados-style grilled pig tails, South African bunny chow (which has nothing to do with rabbit) and balut (more about that duck-egg delicacy later). Your all-over-the-map menu attracts a sundry crowd. 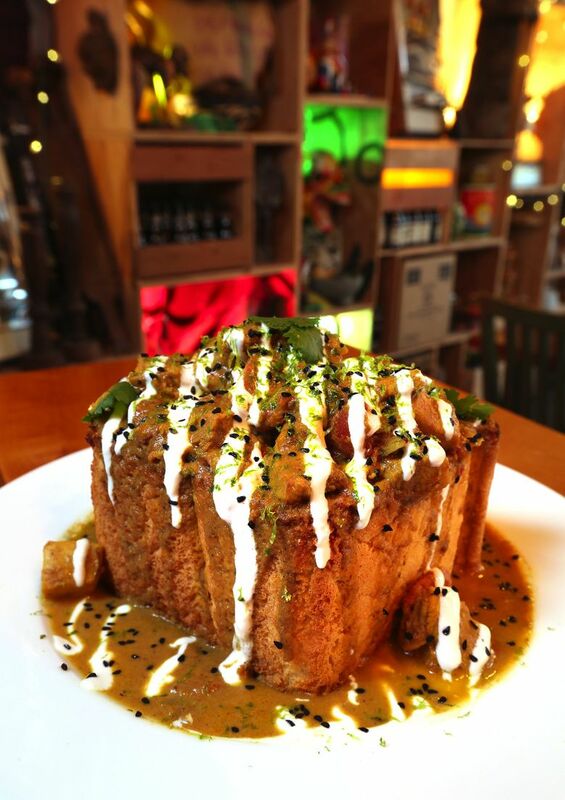 One night, my friend and I sat next to a couple on a nervous first date; another night, a group of East Indians shared a bowl of Trinidad goat curry, and then the bunny chow — a fragrant, filling chicken stew built with Indian masala and served in a hollowed-out quarter Pullman loaf. The waiter was most informative. He explained that bunny chow’s origins trace back to Indian migrant workers in South Africa who ate their supper in the shade of banyan trees. It’s great that your staff is not only familiar with each dish but also knows a little of its backstory. We inquired about Tostilocos and were cautioned that the range of textures in this Tijuana street snack was “very divisive; people either love it or hate it.” Put me in the loved-it column. This is drunk food, I realized, rummaging with a plastic fork (and then my fingers) in a Tostitos bag filled with a delicious, gooey, wet jumble of chips, salsa, corn, jicama, cucumber, peanuts, pickled-pork skin and tamarind candies. Tostilocos would be just the ticket after one too many Dirty Diplomats (a cocktail blending rye and Unicum, a Hungarian herbal liqueur) or Smoked Godfathers (scotch, amaretto and tiki bitters). The Cubano makes a fine drinking companion as well. What sets your not-so-humble ham-and-Swiss sandwich apart is its piquant layer of house-smoked pulled pork shoulder, the subtle crunch of house-made pickles and the demi-baguette from Wild Wheat Bakery, not to mention the dainty, cumin-dusted plantain chips on the side. What’s a drink without wings? They fly out of your kitchen stacked tighter than the Blue Angels. These gargantuan treats are hand-dipped to order in a mix of cornstarch and flour. 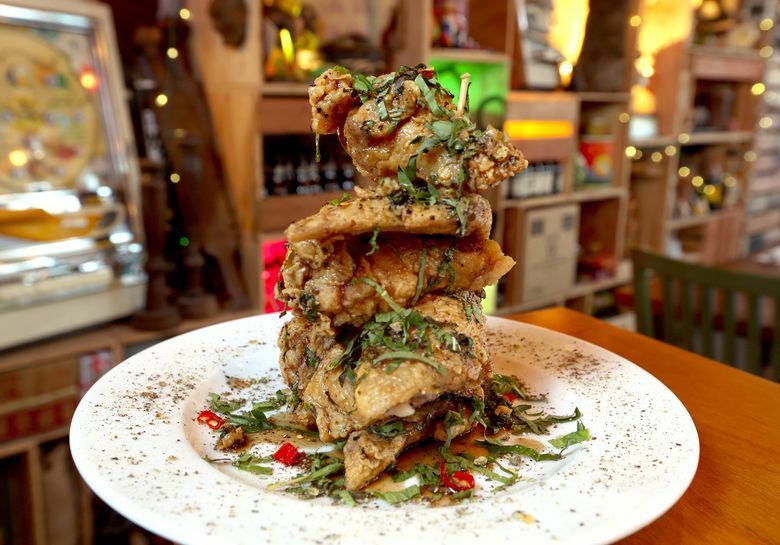 Green Szechuan peppercorns give Chengdu wings a kick that’s closer to fiery fairy dust than a punch in the kisser. The sweet Hungarian paprikash wings appear to be equally popular. Jamaican jerk chicken takes its time. Dirty rice with black beans buffers the chili, lime and allspice that ricochet across the tongue from a moist, smoky, blackened half bird that is worth a 25-minute wait. 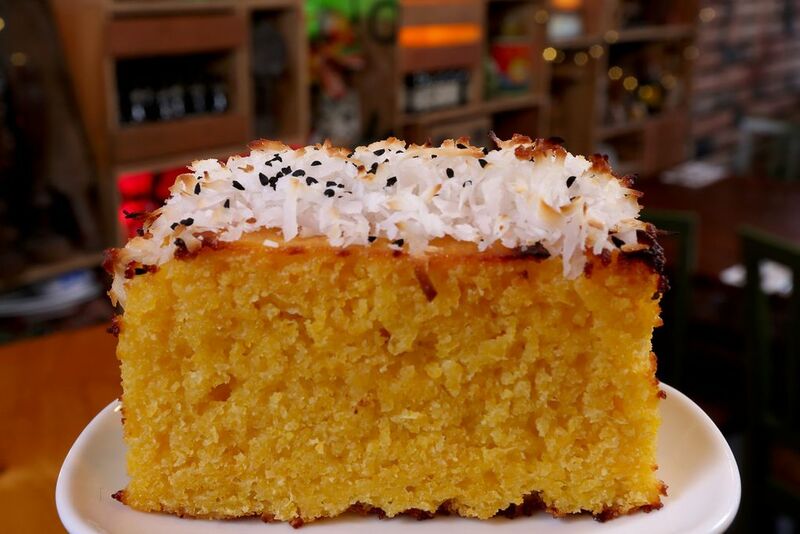 While that chicken cooks, nibble on crumbly, butter-rich pineapple cornbread topped with shredded coconut, or munch those crispy little octopi dipped in harissa, or gnaw on jerk-glazed pig tails — bony, thumb-size morsels of alternately crunchy, yielding meat. Vegetarians do have a couple of options here. (The menu helpfully identifies them, along with vegan and gluten-free items.) Anyone who thinks they are over kale salad needs to try this party-in-a-bowl: bitter greens with tangy feta, toasted almonds, sweet carrots and chopped dates that positively sparkle in a dressing of lime juice and pomegranate syrup. Tender fried Brussels sprouts are a vegan dish. Disregard the mundane dipping sauces; the dry chutney of toasted coconut and garlic sprinkled on top is all these beauties really need. Only a few disappointments marred my virtual world tour. Whole Pacific smelt were carefully fried and presented with a lively tarragon and caper aioli, but they were large fish with big bones that are not the sort one can swallow comfortably. Malaysian curry laksa lacked complexity and suffered from overcooked egg noodles, mealy prawns and a rubbery quail egg. So, Nue, now that I’ve finally made your acquaintance, I’ll be back. I ate things here I’d never had before, including the slightly developed duck egg that Filipinos call balut and the Vietnamese call hot vit lon. Millions adore it. To eat it, tap a hole in one end of the shell, like a soft-boiled chicken egg. Season it as desired with salt, pepper and lime juice. Use a spoon to extract the funky, flavorful broth, then the solids. I didn’t see feathers or a beak — the eggs served here are a little less than halfway to being hatched — but I was unmistakably eating a bird embryo. I can’t say I’d have it again, but I’m glad I tried it.